Rice-a-Roni isn't the only San Francisco treat. Nice Price or Crack Pipe has found a Chevy drop top that gives props to the city by the bay. Yesterday's 1979 Cadillac Eldorado drank from the diesel teat, which was part of the reason that 83% of you downed the haterade in its condemnation. But enough about the hate, let's talk about some love- and if you love sourdough bread, foggy summer mornings, and the enduring legend of an island prison escape, then have we got the car for you! This 1975 Chevy Caprice convertible would be an interesting car even if it were bone stock. Seventy five was the last year for the convertible Caprice, and only 8,349 drop tops left the factory that year. But this Caprice Classic is no ordinary Chevy- and its $14,000 asking price reflects this fact. 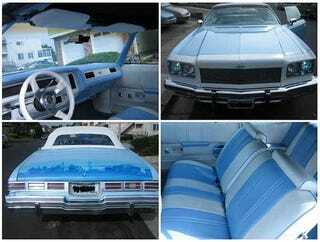 No, the seller has pimped out this car, not in donktastic or low-ri-duhr fashion, but as a jaunty sky blue and white tribute to California's FOURTH largest city. What the color scheme has to do with San Francisco is a bit of a head scratcher, but the trunklid mural (and this last of the gargantuan Caprices has room for the entire cityscape) depicting the iconic structures of the city, including its bridge which is neither golden, nor possesses a gate. The only thing lacking on the car is to have oro en paz, fierro en guerra in script below the driver's window. Not lacking, is what's under the hood of this 4,321-lb boulevarder. The seller claims an over-bored 460 with all the friction-reducing, power-adding mods you could think of, and topped by a cherry of a 670-cfm 4-barrel to feed those hungry, hungry hippos. A 400 THM and 373 Posi rear-end keep the power to the pavement, and the billet grill and HID headlamps will left everybody know you're coming through. So, could you leave your heart in this $14,000 Caprice convertible? Or, does the price and the city homage styling make you want to move out of town? Left my heart in Craigslist, or go here if the ad disappears.